A really easy and popular summery starter, prosciutto crudo and melon … but served in an elegant way! Start by slicing the cantaloupe widthwise, not lengthwise into circles, approx 1/2 cm thick. Remove the seeds in the middle, and with a sharp knife, remove the peel from the melon by cutting it into a rough flower shape. Mix the dressing ingredients and put aside. Place the two different sized flower shapes onto a plate. Take the prosciutto slices, halving lengthwise if necessary. Start by rolling tightly a short tapered end to form the heart of the rose, winding the slice loosely to form a rose. Use as many slices as desired, depending on how big or small you want the rose. 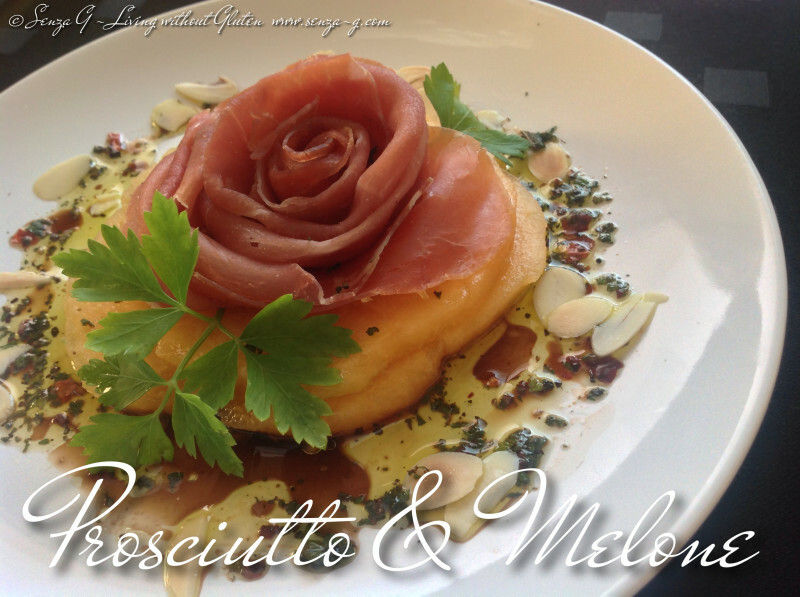 Place the rose on the cantaloupe slices. With a teaspoon, drizzle the dressing all around the cantaloupe and sprinkle with the toasted flaked almonds. Garnish with either parsley sprigs or mint leaves.